Well, they might be finished, but they sure as hell don't fit. 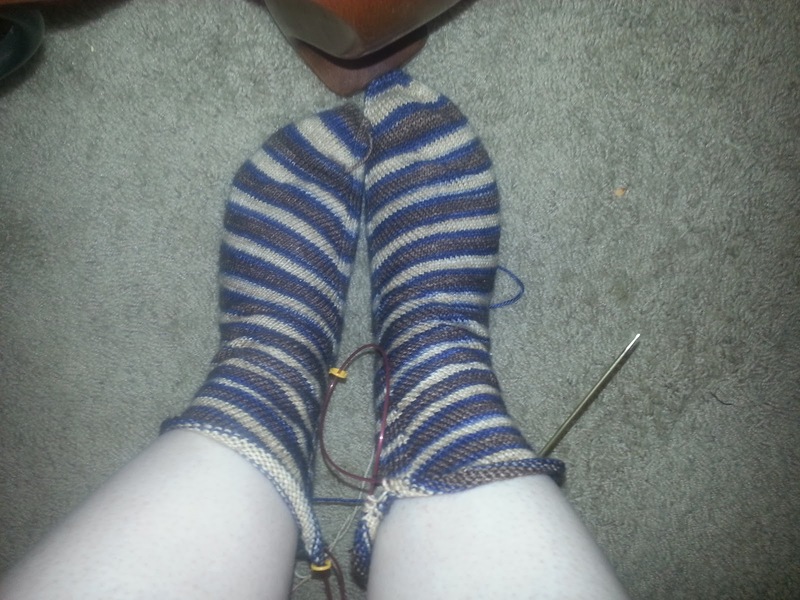 (silent scream) That's right, I'm talking about my Camp Loopy project 1 Skew socks, the ones that were supposed to be finished in June. Hah! I knew when I started the heel I'd gone too far in the foot pattern. I should have stopped at 6.5" and instead I went 7.5" before I'd noticed. Instead of ripping back like I should have (banging head into desk repeatadly) I told myself it would be ok, my fat feet would take up some of the length, I wasn't quite on gauge anyway, it would all be good. Well, it's not. It's about 1/2" too long in the foot. Since the toes and heels are designed to fit snugly, that's not a good thing. No, they won't shrink in the wash (unless they felt, which is BAD). So instead of fitting size 6 feet, they are more around a size 8.5. I am nearly heartbroken. Nearly. I love the yarn. I love the pattern. But they are just socks, after all. Into the gift box they go. So who wears a size 8, 8.5 shoe, anyway? Anyone? Turns out, my little sister does! Yeah! So I made them a Christmas present for her. Of course, I forgot to get a picture of the finished, blocked socks. Typical.